Just this past month, Restorations put out one hell of an AOTY contender with their SideOneDummy-released LP3. To coincide with the album’s arrival, the Philadelphia group embarked on a brief, two-and-a-half-week tour with Self Defense Family which led into and out of punk rock heaven Gainesville, FL’s premiere music festival, The Fest. UTG had the opportunity to have a rather fun chat with frontman/guitarist Jon Loudon at Ybor City, FL’s Pre-Fest 2 about his band’s progression through the years, loosening up, and his approach to finding visuals to pair with his music, among a variety of other topics. Follow the jump to read our interview. So I’m here with Jon Loudon of Restorations. Jon, how are you doing? Jon Loudon: Awesome! I just came out of seeing Self Defense Family; I’m in a good place. Awesome! And you just came into Fest, how was the trip from Atlanta? It was really nice! We drove around a little bit after the show last night, crashed out for a little bit. Woke up this morning, took our time coming down here, and then we went to see some friends in St. Pete, so we spent the late afternoon and drove up and had a nice leisurely day. It’s been cool. Yeah that’s true. Well, yesterday or the day before. What happened was, we set up everything months and months in advance and a few weeks before something happens, something always goes wrong. Taylor Swift’s record came out, and because it’s on such a huge level, they made it so that there were no other records being released that day. They moved everybody’s record releases to accommodate Taylor Swift’s release, which is…typical, I guess. So we had the official release date, which is set in stone through all of our digital distribution and everything, which is all one set thing, and then it’s like “Well…we’re actually putting it out on THIS day, because of Taylor Swift.” But yeah! It’s out now. I’m really excited. It’s official, finally. It seems like you guys have had quite the journey between LP2 and LP3. Though it hasn’t been too long, sonically, the difference is pretty huge. Thanks! We felt like we made a lot of progress on LP2, then we had a little bit of downtime after some pretty intense touring last year, and we were just like, “Oh, we’ll write something for an EP,” and it became this full-length. Everything just sort of happened and we were like, “Oh cool! We got a record, let’s record! Why not?” So here we are. I’m glad it’s kind of hit that way, and not like we were writing more or too much. It’s good to hear. Did you have any other sort of game plan going into the studio? Was it sort of a realization that stemmed from you realizing you had all of this material to use? Or was it sort of a planned thing? This is actually pretty good because we’ve known Jon Low for a long time now. You know what you’re getting into when you go into the studio with somebody you’ve worked with before. It’s the same studio, same producer, the whole band was very comfortable. Everything felt deliberate this time around. Usually you do a lot of feeling around when you get into a place and there’s a lot of re-tracks. This time, it was very boom, boom, boom, boom, boom and the record was done. We just went straight through it and Jon was super on with pointing us in the right direction, making sure everything sounded right, and having this big, full vision of what it was going to be. So it was really fun to work on, because it was a lot less stressful, and you’re not wrestling with this sort of thing the whole time. It was very much like building a house, like “this goes here, this goes here, and then we’re done.” And it was really nice, it was the first time we’ve ever made a record like that. So would you say that by now it’s become sort of routine in a way? Like you guys have learned to work with each other in that much of a natural kind of state? Yeah! Maybe “routine” is the wrong word, but maybe more like “it feels more complete.” It’s less of this daunting challenge [laughs]. So now that you’re onto LP3, has the thought of using an actual album title ever come along? We’ve thought about it! We always get to the point with things like that where if we can’t come up with a name that’s better than our inside joke is, we just kind of leave it. Like how we have songs with letters, because unless there’s something more obvious, we like to have the music do the talking. It seems to just drive reviewers crazy, which is really fun to watch. Yeah, it’s not our strong suit… We don’t like to look too pretentious, so we just have fun with it, that’s just how it is. What were some of the past ones that you had for this album? I think this one was very deliberately decided as #3, we were like, “This has to be LP3.” With the last record, we were like, “Oh, we did the A/B seven-inch, so the first song on this just has to be ‘C.’” But then we were like, “That’s stupid, that’s a dumb joke…we should make the first song ‘D,’ that would be great!” And then every time you put anything else up against it, it’s not as funny as that, so there’s never really an alternative. For LP3, we started to get a little more arty and into it, but then there was nothing really good, or nothing that really stuck for me, so we went with our safety, which was our group inside jokes [laughs]. Yeah! It’s very much like, “this fits.” It’s the logical thing to do, so that’s what it is. So tell me a little more about your video that you did for “Separate Songs.” Was it your idea, or did it come from the director that you worked with? So then we were like, “We’ve got a spot that we can do that in!” The guy in the video is Carlin, our drummer’s brother. They were very nice for letting us shoot there for three days. Mitch Wojcik came up with the original direction for it, and we supplied this sort of semi-autobiographical backdrop for it and our other friend, John Comar, has this very beautiful sense of shooting, gear, and what’s appropriate for video direction, so everybody sort of put their two cents in. John’s editing is crazy and he did such a wonderful job with it, I’m really happy with it. It was a fun time, it was cool. And again, we put it together without much struggle. It was awesome. So what’s your favorite part about Fest, altogether? I just like the adventure of it. You have to not want to see anything. It’s a really good way to learn how to just roll with the punches, because you’re not going to get to see the bands you want to see, you’re not going to be able to go to the places you want to go. You’re going to be hungry, eating the wrong stuff; everything is not the way you had anticipated it. It’s a good way to learn how to roll with things, and have a really lovely time, in spite of it. I’ve seen bands that I’ve never seen before that blew me away, I’ve been to all of these beautiful places, seen all of this cool stuff, met all of these interesting people, all from wandering around at this weird, weekend-long thing. It’s really wonderful; I’ve met some great friends from this. So LP3 definitely has a very interesting album cover. It’s all over the place with all that it has going on. Could you talk me through the reason and story behind it? Long story short, we got to St. Louis, set up and heard somebody across the room yelling at our merch guy. Apparently she knew the guy that had done one of our old shirts, and we were talking to her about that and other artists that all knew each other from different places. She came to us and was like “Hey, I live in a loft, if you want to crash at my studio, you can!” So we went with Danielle back to her place, then she was like, “Hey, take a look through the studio, if you want!” So everyone sort of took a walk through and came back and was like, “Yo, that painting when you go in is incredible!” It was basically the cover of our record, but four feet tall and like five feet wide. Everybody sort of saw it separately and came back saying “I love this!” Since I’m usually the art guy for the band, everybody was like, “Hey this is awesome! We should do something with Danielle down the line, she’s great!” So when it came time to talk about art, everybody was talking about Danielle, and that piece in particular, but at the time, she was sort of showing that in real art shows. I didn’t wanna co-opt anything, like I didn’t want to be like, “Hey, thanks for this thing! It’s ours now, bye!” But she was totally into it, so she gave us this thing for the cover and we have this really beautiful thing that everybody in the band has spontaneously agreed upon. It’s the only time that’s ever happened for us. We usually commission works, and it usually goes really well, but on this one, it seemed like the right thing to do. So if Restorations’ career were sort of like a cliché Hollywood movie, what genre would best represent it? [Laughs] It’s definitely a bad action movie, or something. Maybe like bad kung-fu. It’s been so absurd and strange, with so many unexpected challenges! There’s been some bizarre characters, and it feels like everyone is always coming after us. So let’s make this a little more specific: Where would LP3 fit in, as a scene in this kung-fu movie? This is like the montage. The main character has thought long about all of the things he’s done to get where he’s at, and it’s now the training sequence, where he gets to go off and finish the rest of the movie. We may lose the final boss battle, but who knows? Who knows? That’s up to LP4! [Laughs] So with that said, would you say that you and the rest of the band have finally sort of “narrowed down” the sound and intentions of where you want to take your group, musically? I hope so (in a certain way) because I like that level of comfort, but there’s a lot more we want to do, and I know there’s a lot of unfinished business that we have, sonically, with a few things. While I’m really satisfied with this record and I really feel like we did a lot, I feel like we have a lot more to do, so I’m already looking forward to the next set of writing. I’m just glad it’s registering with everybody. And lastly, are there any plans that you have for the remainder of this year or early into next year that you’d like to subtly hint at, but not really give away just yet? [Laughs] Well really, just Fest and this tour! We’re just doing six or seven up through the Northeast, and then we’re doing our record release show in Philly on November 15, then we’re playing a friend’s thing in Atlantic City the week after that, and then we’re off for the holidays. We’ll spend some time with friends, family, hang out, then probably by the Spring next year, we’ll be doing something else that I can’t talk about yet! 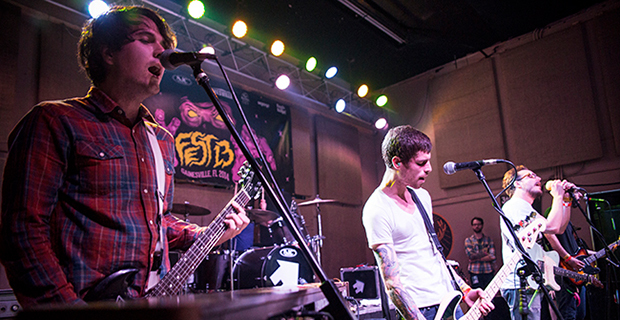 More of Erica Lauren‘s photos from Fest can be found right here. LP3 is available for purchase through SideOneDummy Records, iTunes, and wherever music is available.